Filet mignon is an expensive and tender cut of beef. It is considered the "King of Steaks" because of its melt-in-your-mouth texture. A prime filet mignon can literally be cut with a fork. This beef cut can be quite expensive when dining out, but much more reasonable to make at home, especially if you purchase a whole tenderloin. Filet mignon is French, with filet meaning "thick slice" and mignon meaning "dainty." This prized cut comes from the small end of the tenderloin (called the short loin) which is found on the back rib cage of the animal. This area of the animal is not weight-bearing, thus the connective tissue is not toughened by exercise. The result is extremely tender meat. The actual muscle used is the psoas major. It sits beneath the ribs, next to the backbone, and gets thicker from its pointy end at the ribs to the rear of the animal. As in humans, it is a hip flexor muscle. It has its origins on the lumbar vertebrae and the last rib, and inserts on the trochanter of the femur, the largest leg bone. There are two tenderloins for each animal. The center cut of the tenderloin is used for steaks including the filet mignon, Chateaubriand steak, and beef Wellington. Chateaubriand is cut from the thicker end of the tenderloin. Porterhouse and T-bone steaks include the filet mignon as the medallion of meat on one side of the bone. The tenderloin term applies to the entire strip of tenderloin meat, whereas slices of the tenderloin are termed filet mignon. Filet mignon slices found in the market are generally 1 to 2 inches thick and 2 to 3 inches in diameter, but true mignons are no more than an inch in diameter and are taken from the tapered end. These steaks are naturally rounded as they come from the tube-shaped end of the muscle. The silverskin is usually removed as otherwise, the steak would have a tougher area to chew. The fat is usually well-trimmed, although if left intact it produces more flavor. Look for USDA choice and prime grades. The prime grade has the fattest marbling, which makes it the most tender and flavorful. However, the prime grade is best found at high-end butcher shops and will cost the most. Choice grade is available in more markets and is a better value for your money. You will get an excellent steak and the difference won't be enough to justify the cost. When selecting tenderloin or filet mignon slices, choose the lighter-colored ones over dark red as this indicates more marbling. You will want steaks of the same shape and thickness for consistency of cooking, especially when cooking them at the same time. The steak should be firm to the touch and there shouldn't be much red liquid in the packaging. You will see grass-fed filet mignon, which some people prefer because the raising methods are considered more humane and sustainable. As well, there are differences in the nutrient composition of the steak. However, grass-fed beef usually has even less fat marbling than grain-fed or corn-fed beef, so it may be less tender. There can also be a difference in flavor, with some people preferring grass-fed and others preferring the other raising methods. Grass-fed beef will usually cost more as well. Although filet mignon is very tender, the beef flavor is proportionately lessened. As such, it is often served with an accompanying sauce incorporating the pan juices, or with a compound butter. It may also be marinated, smoked, wrapped in bacon, or seasoned with a rub. 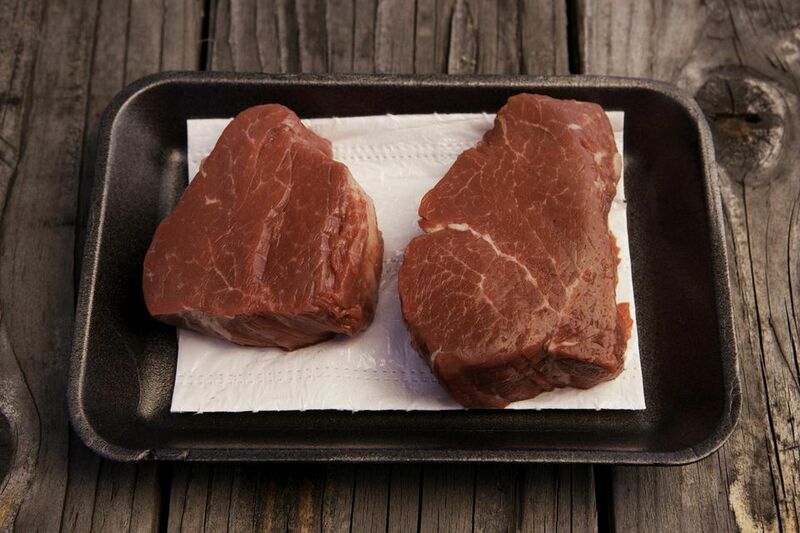 Filet mignon can be cooked in a variety of ways, including grilling, broiling, roasting, and pan frying. Usually, high heat is first applied to sear the meat on both sides. Then it is transferred to lower heat to finish the steak to the desired doneness. Also, cubed tenderloin is a popular choice for fondue hot-pots and shish-kebabs. Take the steak out of the refrigerator 30 minutes to an hour before cooking to allow it to come to room temperature. This will result in more even cooking. Since the beef tenderloin and filet mignon have no surrounding fat tissue, they are often wrapped in a layer of fat (called barding) such as suet or bacon to keep it from drying out and to add flavor. Use a dry, high heat method such as broiling, roasting, pan-frying, or grilling for this tender cut. This cut is so tender that it should never be cooked beyond a medium-rare stage. The longer you cook it, the less tender and drier it becomes. Use an instant-read meat thermometer or the touch method. For medium-rare, remove the steak from the heat when it reaches 120 to 125 degrees Fahrenheit. You will see ranges for medium-rare from 120 to 130 degrees, but it's best to stick with the lower end so as not to overcook your steak, as the temperature will rise while it is resting. For the touch method, press the meat. If it feels soft and mushy and leaves an imprint, it is rare. If it is soft but slightly resilient, it is medium-rare. The minute it begins to feel firm, it is overdone. Do not cut into the meat to check for doneness as this lets precious juices escape. After removing the filet mignon from the heat, cover it with foil and allow it to rest for five to 10 minutes before serving. Resting allows the heat and juices to be evenly distributed in the steak. Serve the filet mignon with a pat of compound butter or with a sauce made with the pan juices.